This is a simple and delicious way to cook catfish, and it works as well over a campfire as it does on the stovetop burner. Feel free to use a seasoning salt blend or Southwest seasoning instead of Creole or Cajun seasoning. The typical Southern catfish restaurant offers all kinds of fried dishes, but catfish is always the star. Fried dill pickles, fried okra, green tomatoes, and jalapeno peppers are commonly found on menus. The fried catfish—and plenty of it—is usually served as a complete dinner with slaw, hush puppies, and French fries. Choose a creamy coleslaw or a lighter slaw, like this Carolina slaw or kale and cabbage slaw. Pour about 1/4-inch of canola oil in a large heavy skillet. Place over medium heat and heat until hot. Sprinkle the fish fillets lightly with Creole seasoning, salt, and pepper. In a wide bowl, combine the cornmeal and flour. Pour the buttermilk into a bowl. Dip the fish into the buttermilk to coat, then coat with the cornmeal mixture. Arrange carefully in the oil and cook slowly for about 3 to 4 minutes, until the bottom side is browned. Turn carefully and continue cooking until browned on the other side. Place on paper towels to drain. Serve with tartar sauce and hush puppies, along with coleslaw and fries. Or, try it with this delicious Remoulade Sauce. 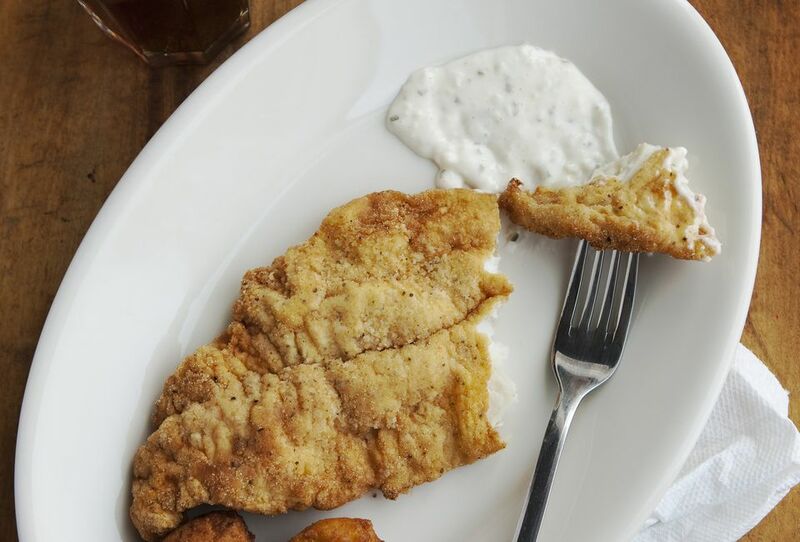 While catfish is traditional for a Southern fish fry, any firm and mild white fish will suffice. Flounder, bass, haddock, and cod are all good alternatives.